Specialty tool for turning the inside of segmented vessels. The raised rim of the cutter is razor sharp and slices through wood fibers with ease. If you've ever had a catch while turning (and who hasn't? ), you know how devisatating it can be to the project. The shape of the shank holding the cutter prevents you from prsenting the cutter to the wood at an angle that would create a catch. The optional handle is a large, machined turned hardwood handle. If you choose to use your own handle, the 1/2" shank fits perfectly into handle adapters provided by any tool manufacturer of quality handles. As a THANK YOU for purchasing this new product from Hunter Tools, enter 'osprey8' as a coupon code during checkout to receive $8 to partially offset the cost of shipping. This coupon is good until December 31, 2017. 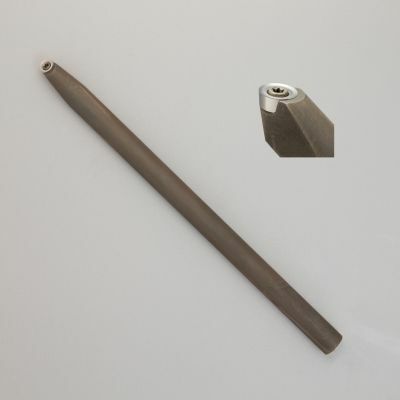 This may be the last bowl / spindle gouge you will ever buy. The tool uses the #2 Hunter Carbide Butter and is fabricated on a 1/2" round shank. The Osprey is a great tool for those fine finish cuts. It is used just like any other gouge ... anchor, bevel, cut. The Hunter Tool components consist of the cutter, screw and torx wrench. Each part is matched to the specific size. This tool uses the #2 cutter and ships with a #2 torx wrench. It is shipped complete and ready to use. Be careful when changing the cutter as is tiny and you are not likely to have a replacement in your shop. Even though the cutters last a long time, it is recommended to purchase a spare cutter for use as needed. Replacement torx screws are also available for purchase.